the sound "you" as in "cure" and "pure" is technically the consonant "y" plus "ooh" as in soon. This sound is also in "cute" (as distinct from the "ooh" sound in "coot"), and is absent from this chart because it doesn't fit under any of the headings, as it's a consonant plus a vowel. However thinking of it this way doesn't help you spell it, and in spelling lessons it's better to just think of it as another vowel (unless a learner correctly points out they can hear a "y" sound in it). except in US and other Englishes in which "r" after vowels is pronounced. For explaining-spelling-patterns-in-a-way-that-makes-sense purposes, it's best to think of monophthongs and diphthongs as single vowels, and triphthongs as two separate vowels. However, if you are clapping or tapping out syllables, you will notice that many children will tap twice for syllables with diphthongs in them, because they can hear both the vowels. Which is clever of them, but not going to help them with reading or spelling them, which is the point of the exercise. Puppets saying syllables containing diphthongs generally only open and close their mouths only once, but are more likely to treat triphthongs as two sounds, and open and close twice. Try making your puppet/hand say "flour", "flower", "hire", "higher" and "cure" in a slightly exaggerated way, and I'll bet it opens and closes its "mouth" twice, not just once. That's because (at least in my accent) the middle vowel in the triphthong in "flour/flower" and "cure" is the vowel "ooh", and the vowel "ooh" is very much like the consonant "w". Likewise, the middle bit of the triphthong in "hire/higher" is an "ee" sound which is very like the consonant "y" (see also this earlier blog post about overlap between vowels and consonants). So we narrow our vocal tract quite a bit in the middle of our triphthongs, in a way that makes them seem like two vowels (a diphthong and an unstressed vowel), rather than one. Of course, it's possible to treat words like these as either one or two syllables, but for counting syllables and spelling purposes, it's better to teach and learn them as two syllables. The reasons for this probably need a separate blog post. 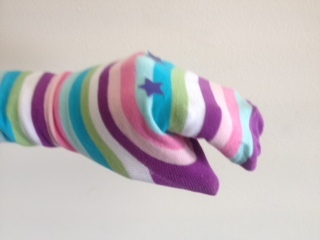 I hope you're persuaded that using sock puppets (or Rigadoon dolls, or snapping crocodiles, or any sort of toy with a movable mouth) is more likely to get children counting syllables in a way that helps them with spelling than tapping or clapping syllables. If you have other strategies like this one you would like to share on the amazing internets, please email them to me at spelfabet@gmail.com and I will of course give you the credit.